Product prices and availability are accurate as of 2019-04-23 19:12:52 UTC and are subject to change. Any price and availability information displayed on http://www.amazon.com/ at the time of purchase will apply to the purchase of this product. 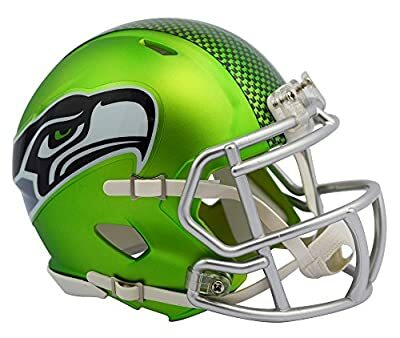 Seattle Seahawks Speed Mini Football Helmet. Our new, distinctively fresh, yet familiar alternate helmet collection adds a colorful twist to your favorite NFL team helmet. Blaze Alternates utilize different color schemes for the shells and facemasks with a unique paint technique that gives the colors a distinctive glow. Official NFL mini football helmet with official NFL team decals. ABS plastic mini football helmet shells with plastic facemask. Realistic interior foam padding, vinyl-leather chin strap. A must-have addition to any collection! Size: 1/2 scale versions of NFL football helmets. Size: 6"(L), 4 1/2"(W), 5"(H) - (NOT FOR WEARING).